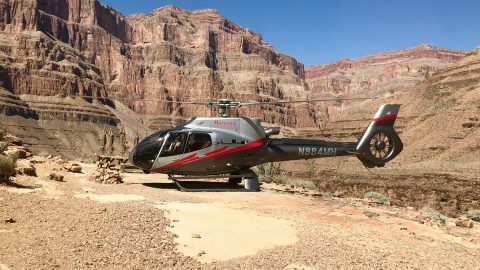 *This experience was sponsored by Desert Adventures Red Jeep Tours. Departing from East Palm Springs in a bright red jeep, we tumbled along the paved road until it ended in dirt. Our excellent and knowledgeable tour guide, Karen, peppered us with stories and facts about the history of the Coachella Valley. She was very good at keeping us interested and entertained, knowing the kids would lose patience quickly if they weren’t engaged in the conversation. At all costs, we wanted to avoid that teen eye rolling which signals an oncoming storm. This tour delivered the goods. 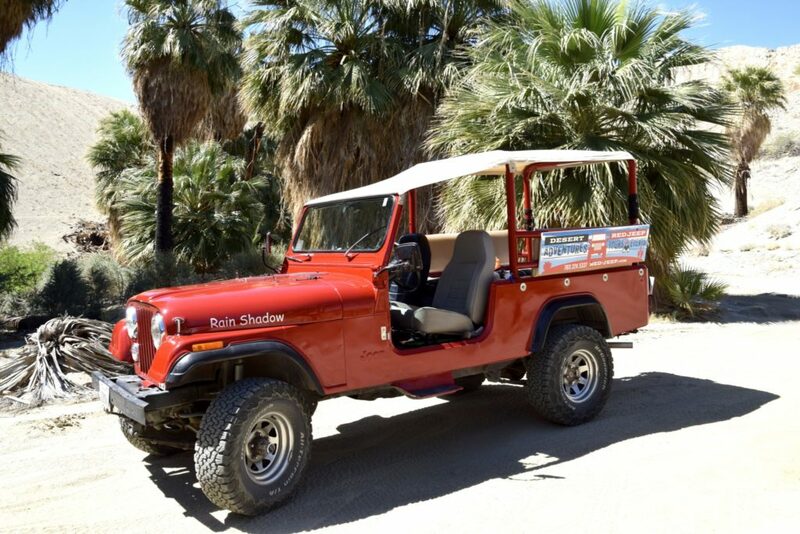 The namesake Red Jeep of the Red Jeep Tour took us on a wild ride through the San Andreas Fault. When we hit the dirt road, things started to get interesting as we wound our way down a dusty trail towards the Little San Bernardino Mountains northeast of Palm Springs. Passing through several closed and locked gates, we entered private property that went on for miles and miles. Desolate and dry desert was our view in any direction except ahead, as we pointed towards rocky outcroppings in the distance. We were on our way to the fault line, but first we would stop for a visit to a real desert oasis. Palm Springs is aptly named, considering the city and valley sit among a series of natural springs that bubble up through the desert. These little pools of water are enough to support some significant groves of California Fan Palms, which lend themselves to the city’s name – Palm. Springs. Duh. 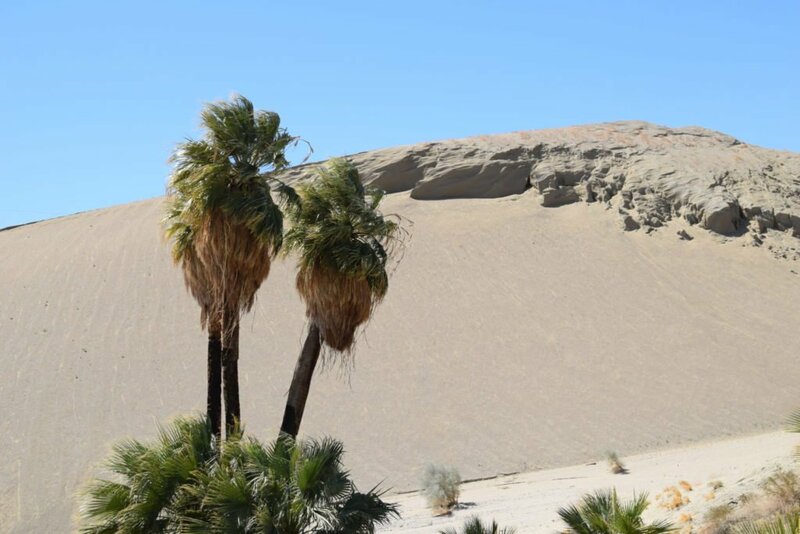 In the middle of the desert, California Fan Palms thrive at this oasis near a natural spring. Anyway, it’s pretty amazing to see these pockets of green in the middle of the rocky desert. And these oases are resilient too, making it through droughts and fires and a host of other difficulties to continue thriving and providing a wee bit of shade from the hot sun. Winding our way towards the fault line, Karen drove the jeep through narrow canyons with rocky overhangs and roads that appeared too narrow for a jeep – but we made it. In one place, we met another jeep coming the opposite direction and it was touch-and-go as to who would have to back up and pull over (we won). The farther into the canyon we drove, the tighter the canyon walls closed in. It started to feel a little creepy, and then it opened up again into a little clearing where we parked and got out. 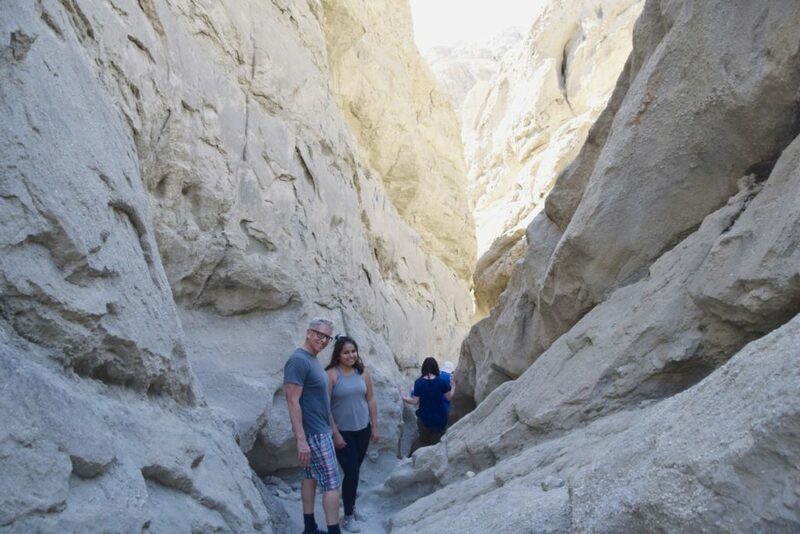 Hiking the slot canyons around the San Andreas Fault in Palm Springs made us a little neeeerrrvous. High above, the cliffs were pockmarked with round holes where rocks had loosened from the cliff face and fallen to the ground below. Inside these holes live many desert creatures, the most regal of which is the Great Horned Owl. A night hunter, the nocturnal Owl hunts mostly small rodents and lizards (and the occasional rattlesnake), bringing them back to its lair for a tasty meal. Evidently it cannot digest the fur and bones, and spits them out in the form of this pellet-like thing. Karen found one and broke it apart with her bare hands so we could see the bones. This creeped the kids out big time. Our Red Jeep Tour guide Karen, holding an owl pellet, right before she used her bare hands to break it up and show us undigested bones and fur. Ugh. Then we hiked into a slot canyon, slithering through the narrow crevices created by years of rumbling earth movement. Rocks teetered on cliff edges, and boulders perched at precarious angles, which Karen assured us was perfectly safe. We posed nervously for photos and got the hell out. Reaching the San Andreas Fault, we were all surprised to see it was hardly visible – at least not directly. We were standing in the middle of it, hundreds of yards wide in either direction. The kids expected to see a giant crack in the ground, where if you looked down you might see the center of the earth. Nope, it’s more subtle than that in a scary way. The earth is moving all the time along the fault, sometimes slowly and sometimes abruptly causing what we know as an earthquake. The tectonic plates are sliding in opposite directions against each other, causing friction that sometimes slips and jars the land and its inhabitants. Notice how happy Sophia looks in this photo – she just adored hiking in the hot desert sun. 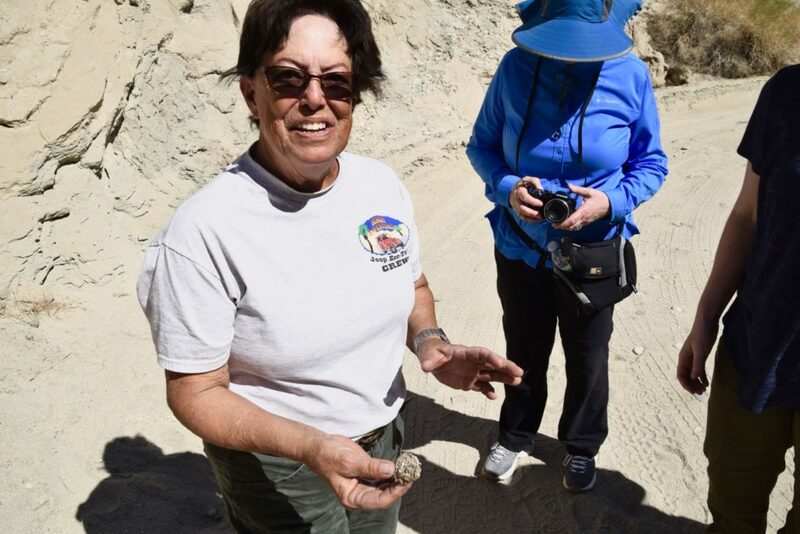 Here, Karen explained, the slow friction and erosion cause the desert sands to fill whatever crack might actually exist in the Earth’s surface, A very fine sand is formed, and the most you see of the San Andreas Fault is a line in the sand. Literally. Except for the fact that there are two huge rock formations, slanting away from the fault on either side. It looks as though a knife cut through cake and pushed the pieces up on either side as it moved through. Out in the middle of this nowhere, it’s hard to believe that anyone could or would want to live here. The Cahuilla Indians did, and made it their home for centuries before getting pushed out of their lands by settlers and the railroad. From what we learned on the tour, they had a pretty decent life figured out. Food, water, shelter and shade – doesn’t sound that bad to me! 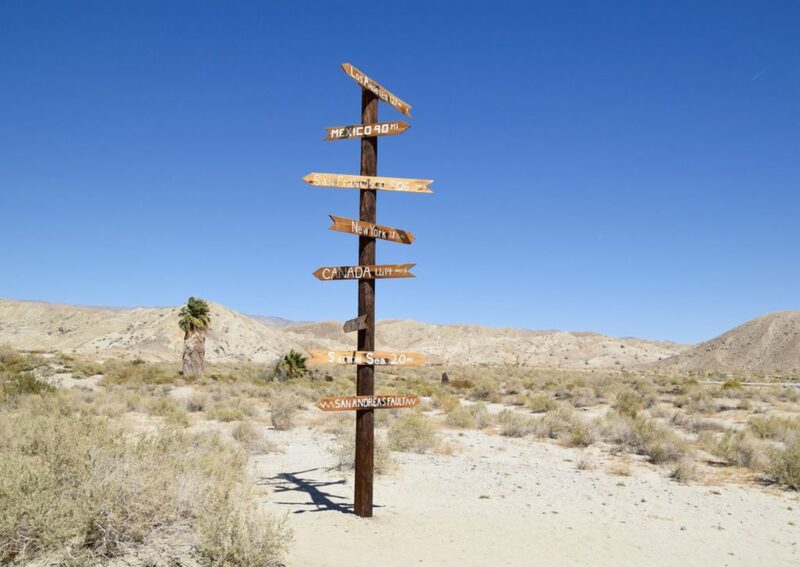 The sign post in the middle of No Man’s Land near the San Andreas Fault. Good thing we were comfy in our Red Jeep. Some intrepid “off-gridders” still occupy parcels of land out here, and we passed a couple of dwellings that were pretty isolated. Still, it’s only a short drive back into town for a nice umbrella drink and a set of tennis or two. And I bet the land’s cheap. The Red Jeep Tour costs $ 139 per adult/$114 for kids under 12 for three hours of fun, and it was pretty darn awesome. 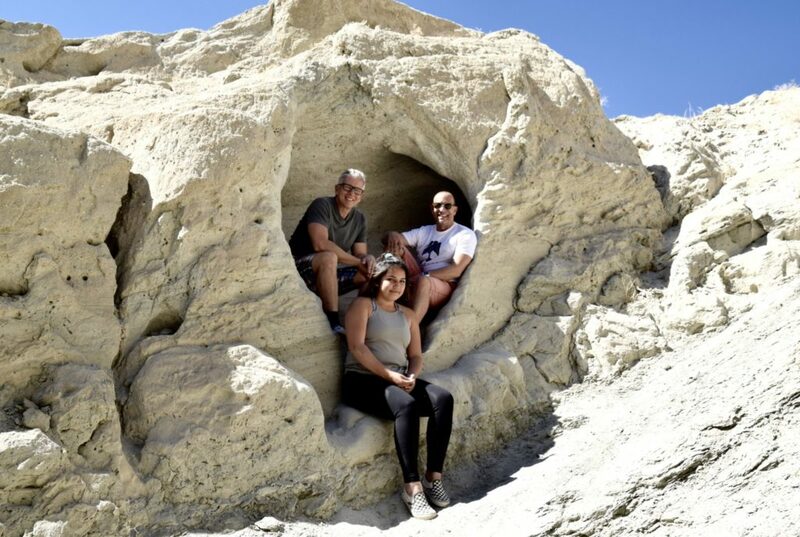 Our family has never done anything quite like this, and seeing the San Andreas Fault up close was a very unique experience. We’d definitely do it again!